Even though I have been hooping for years, after completing the Hoop Love Coach Training I now have a more solid understanding about the foundational moves, tricks, and transitions that will transfer over into teaching others the art of hoop dance. My confidence received a huge boost and I have now moved forward with instructing a hoop dance class at a local country club. I found that HLC training helped me most with breaking down how to organize a class and be prepared when moving forward with instruction. I found it amazing to be able to have a coaching call with Deanne to connect and be able to ask about your personal beginnings as a hoop dance instructor. It helped calm my nerves and assist me with moving forward with confidence. It’s nice knowing someone has gone before you and can give insight and tips for successful execution. I have just instructed my very first hoop class and it was awesome! Taking this course has changed my life. I am excited to be on this journey doing what I love, helping people get healthy, and creating a fun and supportive community of happy hoopers! My main goal in life is to be happy. As a free-spirited artist and jack of all trades, I love variety, freedom and fun. I also wish peace, love and happiness for everyone here on this amazing Earth we all call home. I believe that there is more than enough for all of us to have all that we need when we live authentically. It’s an abundant world with so much to be grateful for and life is better when we spread the joy! Hoop Love Coach training gave me the courage I needed to put myself out there. I’ve always been somewhat shy and introverted but after gaining the skills and confidence with Deanne Love’s empowering way of teaching I finally was able to step out of my comfort zone and say, “Yes! 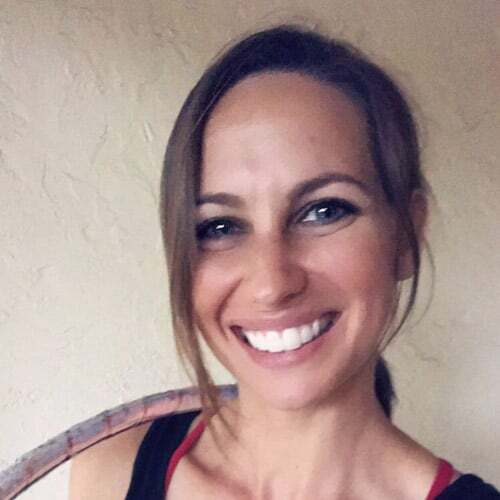 I am a hoop teacher!” I am forever grateful for the ability I now have to share with others the happiness that happens with the magic of hoops and movement. What I found most helpful was the well-rounded approach to teaching all different styles and skills with the constant reminder to be oneself. I loved the concept of finding our own *secret sauce*, the best way to success is to be our own (sometimes crazy) fun selves and to put our own spin on teaching. I am also very grateful to be able to go back and reference all the material from the online courses for Hoop Love Coaching. It’s an incredible resource to have available for refreshing my memory and inspiring new ideas for class. Thank you!!!! 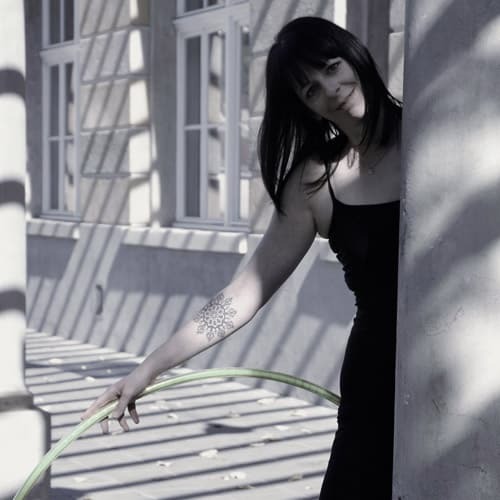 I currently am teaching a Hoop class two nights a week at the downtown YMCA. Never in my wildest dreams did I expect to be a fitness instructor at one of the biggest fitness establishments that I know of. I remember attending classes at this YMCA with my Mom when I was just a little girl and now I’m teaching Hooping there! It still scares the crap out of me some days thinking about it but I push thru the fear and always have fun during class. I love it! I am based in the Blue Mountains NSW and run hula hooping classes. parties and workshops for kids and adults. I am a qualified personal trainer, hula hoop teacher, circus entertainer and community arts worker. I am also a single parent with a vibrant 3-year-old. Finishing the HLC training enabled me to kickstart my business. Before then, I had the skills but now I feel confident in stepping out there and launching my business. The course gave me a clear direction and the tools that I needed to start my business. What I most loved and found most helpful about the course was the support from Deanne and having to sit down and start planning classes. This broke through my creative blocks and gave me a foundation for my future classes. I have struggled with a lack of free time and support and have had to develop my business slowly. This has been frustrating when I look at other people that are able to dive in and create a thriving business straight away. When I think about this I realise that having a slowly developing business has worked well for me as I am able to assess my offerings and let my business grow at a good pace. I have since enrolled in the Little Circles Group because I trust Deanne’s teachings and my business has gone in an unexpected direction of running a lot of kid’s workshops. I have been getting a huge amount of value out of doing this course and I find myself dipping into the course material over and over again. Dancing always fascinated me. In search of a form of modern dance, fitness as well as body and mind relax, I found 2014 Hoop Dance. The different styles and possibilities excited me so much that in 2016 I successfully completed my Hoop Dance Teacher certificate. For me, hooping is a true healer who wonderfully complements and enriches my life. I love the individual, unique and specialness of Hoop Dance. Each person is unique and perfect in their own way and this is reflected in Hoop Dance. Hoop Dance puts a smile on everyone’s face. My motto: Never miss a chance to hoop dance. The HLC teacher training has given me not only tricks but sooo much more. New paths have opened up, new contacts and new hoop friends. I decided to be brave and go my own way and now it feels so real and good. I have so many ideas and I love to do all this and share my hoop love. This teacher training has been so helpful because it includes all you need to start, the community of all the teachers is sooo great. Thank you so much for your support and all your time. Hoop Dance is the best thing that has happened to me. My new dance partner (the circle) has always got time if I have time. I like to dance my own style and do the tricks I love or my body would like. Not everybody is the same (everyone has another story), not every trick feels good for my body (especially after my back problems last year – but I have never given up – Hoop Dance and the community and my students give me so much love, that I am back on my feet again and come back to my hoop journey – my story) but this different styles and the possibilities in HOOP DANCE excited me so much. Hooping makes me happy. the harmony of body and mind, it reduces stress, it is a modern dance, it is personal, it is fantastic, exciting, wonderful, inspiring, shiny, colourful, hoop dance is YOU & ME. 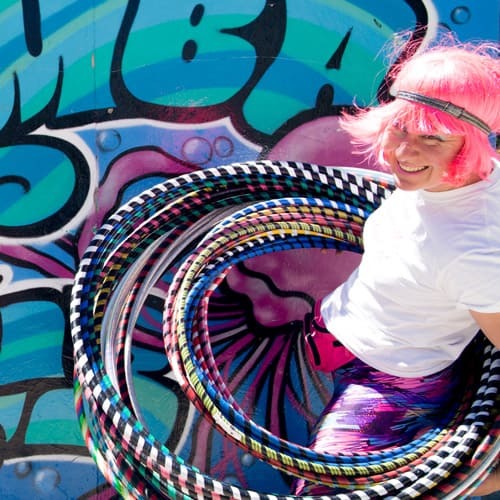 Confession: “I’ve NEVER been able to hula hoop!” That’s what Instructor Angela Reitter thought until she gave it another whirl with a big hoop, it actually, stayed up, and WHAMO! (Pun intended). At age 45 a hooper was born! Spinning on the waist is amazing, but soon she wanted to learn more. Hoop classes were unheard of, but the internet offered hundreds of free youtube tutorials. Learning to flow with the hula hoop on and off body turned out to be addictive, show-stopping, total mind & body workout! With the help of online hoop gurus like Deanne Love & Rachel Lust, Angela became certified as a HoopLove Coach in 2016. Now she shares the joy of learning to rock out and dance with a hoop in live and local classes for adults, kids, & seated seniors. Her classes feature hit playlists to rock your core, skills and drills to train your brain, & combos to find your flow. She also performs demos, hosts themed Hoop Jams, & makes custom travel hoops. When not in the hoop, she designs and illustrates themed concepts for a global Christmas ornament manufacturer. Completing HLC training gave me the confidence to actively pursue teaching. Initially, I didn’t think I was good enough to teach or know how/where to even get started. The training taps into a lot of self-examination that leads to discovery and focus on your unique offering. What I found helpful from the HLC training was the endless ideas and resources included in the training which were great for getting started, but the continued support and inspiration even years later are incredibly rewarding. 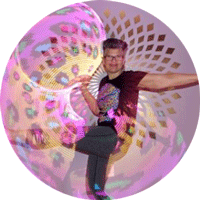 I had to overcome a knee injury and spent 6 weeks seated hooping. This became a blessing as it led to the opportunity to create a seated Senior hooping program. My favourite part is it brings the joy of dancing with a hoop to everyone, no waist-hooping required. You do not have to be perfect to share something of value to others. Enjoy the journey, you will always be learning so you may as well embrace being Fiercely Flawsome! My name is Carlye Wilde and I am the owner of Wilde Moon Studios in the beautiful Snoqualmie Valley in the state of Washington. I’m a certified Yoga and Zumba Instructor as well as a Hoop Love Coach. I have three beautiful girls and love sharing my passion for healthy living with them and our community. After the HLC training, I felt the confidence to become more creative after learning the hoop dance basics from Deanne. Her creative attitude along with professional education helped me embrace using the hoop in my personal yoga practice and then with students. I absolutely loved Deanne. Her accepting and patient attitude made me feel like I could achieve my goals. I also enjoyed her playfulness which made me want to continue to come back, again and again, to practice with her. When I took the training I was looking to get in touch with my playful nature. I believe it’s very important as we move through the inevitable stresses of adulthood that we find joy. A hoop brings a smile, a laugh, and lightheartedness to my days. During the HLC training, I was going through a painful divorce. My hooping kept me grounded and at the same time, I felt myself expanding and growing. In some dark times, my hoop was a circle of brightness. Now I own my own studio and am so grateful to share yoga and hooping with my yoga community. I’m in love with my life and embrace all the seen and unforeseen changes ahead. I’d also like to share that for years I worked with senior citizens. The ones who were the youngest were young at heart. Age didn’t matter, their willingness to laugh and play did. It taught me not to hold too tight to stress or negativity but remember to play! Grab your hoop and play! It doesn’t matter what it looks like, there’s no wrong way, just be your beautiful self!